Nathaniel Lyon was perhaps the most colorful Connecticut native who served the Union in the Civil War. Born in Ashford in 1818, Lyon was a career soldier who had graduated from West Point in the Class of 1841. 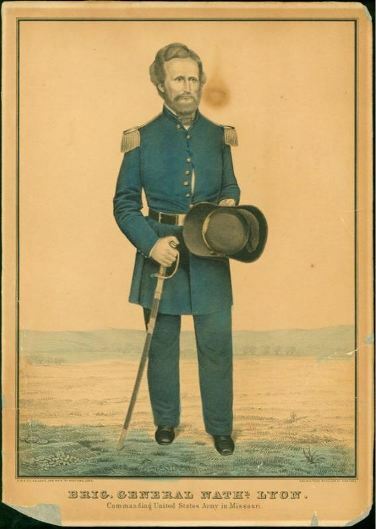 He amassed a distinguished combat record in the Army after his graduation, serving with distinction in the Seminole and Mexican Wars, against American Indians in various western posts, and against Missouri border “ruffians” in the Bleeding Kansas affair. 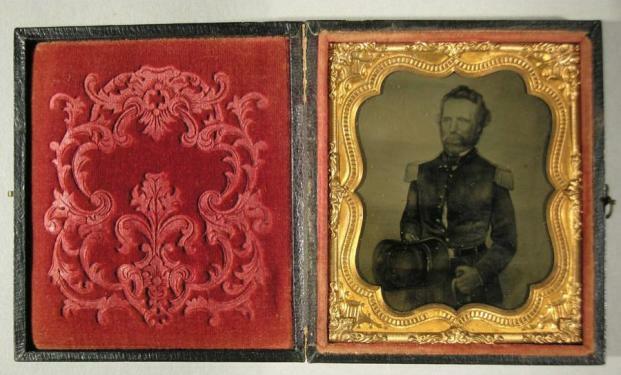 On the eve of the Civil War, Lyon was a captain serving with Company D of the 2nd US Infantry, posted in St. Louis, Missouri. Lyon was very much an eccentric in the pre-war army; he was a fanatical abolitionist and Congregational zealot and used corporal punishment for even the smallest infractions. Missouri was a slave state, and in 1861, its governor Claiborne Fox Jackson formed a pro-secessionist paramilitary force to intimidate the state legislature into voting for secession. Nathaniel Lyon, although only a captain in rank, went over the heads of his superiors and made a surprise assault on Jackson’s militia, camped in St. Louis and threatening the US arsenal there. In the rioting that followed, over 20 civilians were killed, but Lyon’s efforts may have assured that Missouri remained part of the Union. Lyon was appointed commander of the Army of Missouri on July 1, 1861. He fought several battles with secessionist forces that summer that put the Rebels to flight. On August 10, 1861, he caught up with them at Wilson’s Creek, a few miles from Springfield, Missouri. Outnumbered nearly two to one, Lyon impetuously attacked anyway. He led from the front, as was his custom, and it was not long before he was wounded in the arm and leg. Ignoring his wounds, he grabbed the flag of a nearby regiment and urged his men on, only to be shot several more times and finally killed. His death precipitated an unruly retreat from the field by US forces. His body was recovered and made a long journey home by rail to Ashford, where he was laid to rest before a crowd of 15,000 mourners. He was the first Union general to die in the Civil War. The collections of the Connecticut Historical Society include a hat and gauntlets worn by General Lyon as well as several lithographs and photographs depicting him and his exploits. John Potter holds an MA in History from Shippensburg University and was a Research Center Assistant at the Connecticut Historical Society.